Le Café Jazz Quartet add a distinctive French ‘Hot Club’ influence to their interpretations of Broadway Swing classics and jazz standards. Violin, vocals and solo guitar share the lead, embellishing the topline with melodic arabesques, while rhythm guitar and double-bass provide a secure underpinning harmonic and rhythmic framework. This unusual line-up brings a fresh interpretation to the well-worn jazz standard repertoire. Find out more about booking Le Café Jazz: Swing Jazz band for weddings. Le Café Jazz can offer a variety of line-ups to suit different occasions, from a violin and guitar/vocals duo right up to a powerful six-piece featuring keyboards and twin violin; drums can also be included to deliver extra rhythmic punch and texture. This flexible line-up presents an attractive and unusual take on the popular swing jazz and ‘Ratpack’ repertoire, and can amply demonstrate its musical versatility by genre-hopping into a set of toe-tapping bluegrass, country, rockabilly, blues or even traditional Celtic territory when the occasion demands. Le Café Jazz can present an ideal and sophisticated choice for musical entertainment at wedding receptions or other parties, large or small. 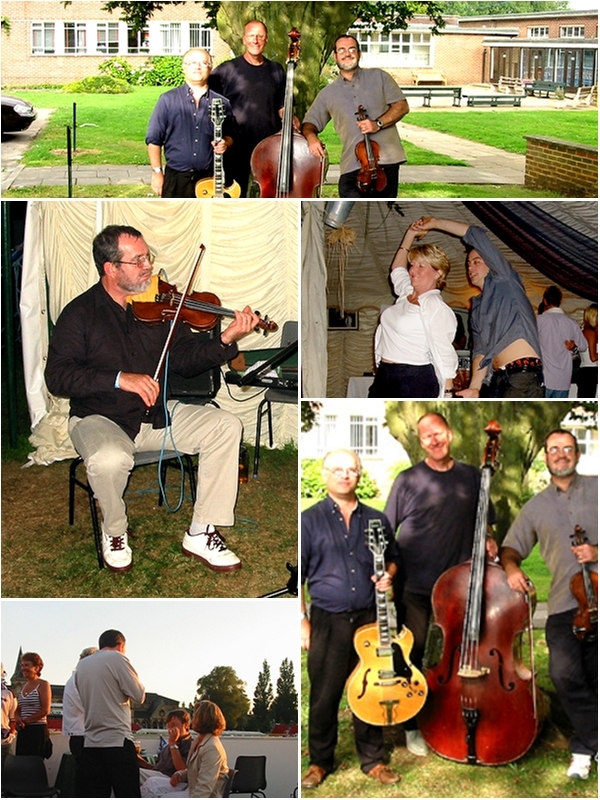 Swing jazz, delivered ‘Hot Club’-style, will bring a distinctive touch of class to any celebration.